Death of Washington, pub. by James Baillie, circa 1845. On the night of December 14, 1799, "His Excellency" George Washington slipped into eternity at his beloved Mount Vernon estate. As news of his death spread, many of Washington's fellow countrymen sensed that the first chapter of American history had ended. The winning of American independence and the creation of a new nation were the seminal events in United States history, and in the public's mind Washington had been the central figure in both of them. 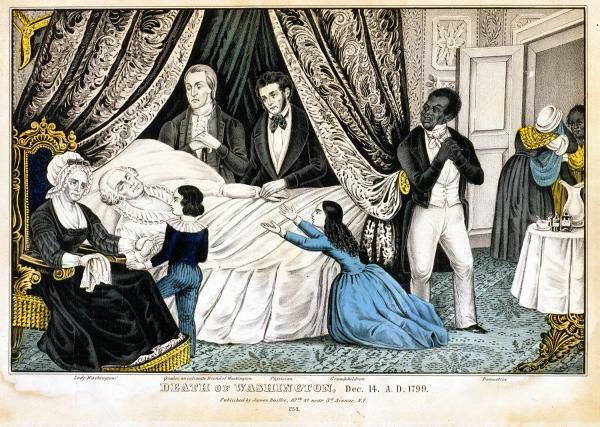 In the decades that followed, images of Washington and of his death, including this hand-colored lithograph by New York publisher James Baillie, graced the walls of many American homes.